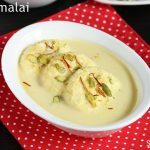 Rasmalai recipe – Learn how to make easy rasmalai that is soft and mouth melting. 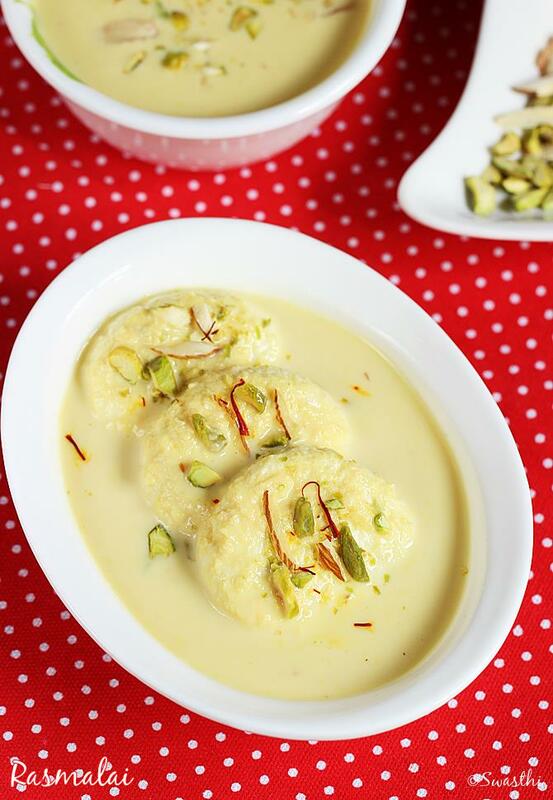 Rasmalai is a Bengali delicacy that is very popular among the Indian Sweet Lovers. Ras malai – Ras literally translates to “juice” and malai to “cream”. 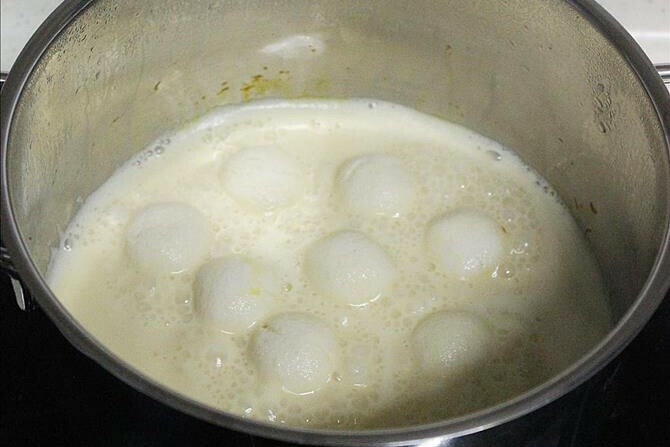 To make rasmalai, flattened balls of Chenna are cooked in sugar syrup first. Then later dunked in sweetened thickened milk that is of cream consistency. 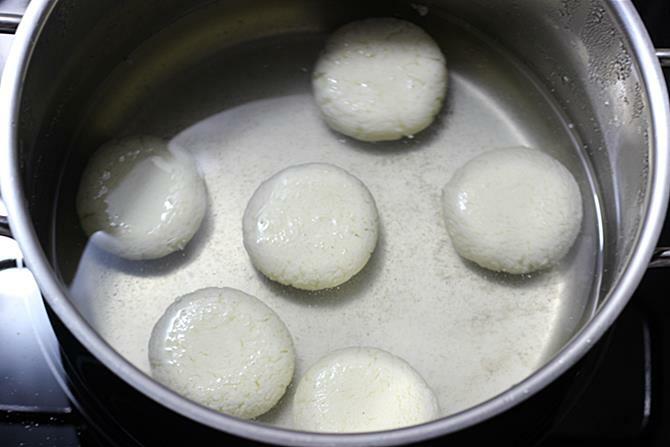 These flattened balls or discs are juicy after soaking up the creamy thick milk. They are garnished with nuts, chilled and enjoyed. 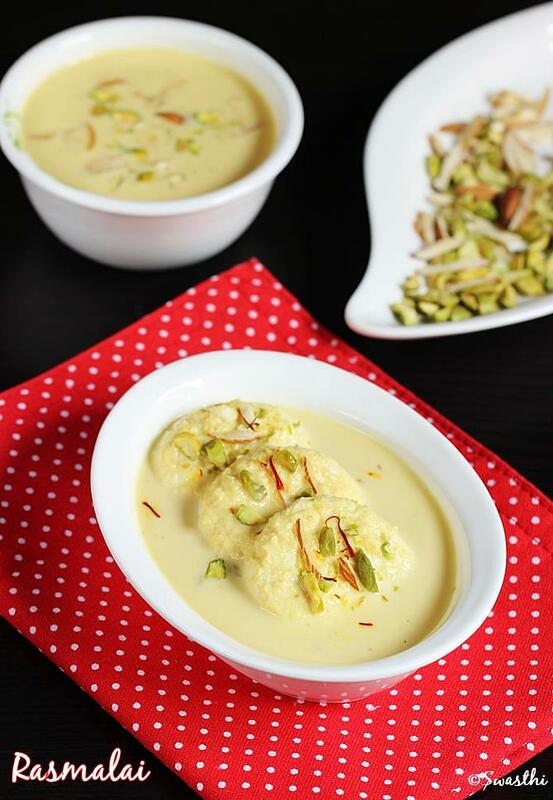 Rasmalai are a melt in the mouth with juicy cream in every bite. They are so delicious that anyone who tastes these get mesmerized and would long for more. You can also check this Collection of 100 diwali recipes for the festive season. 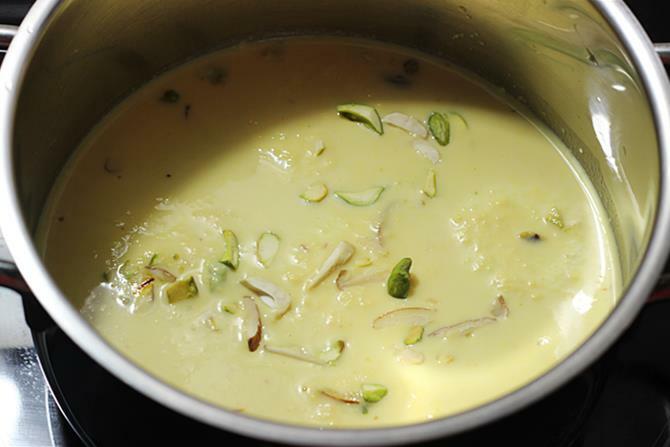 Rasmalai can be made in 2 ways. I am sharing both the methods. 1. 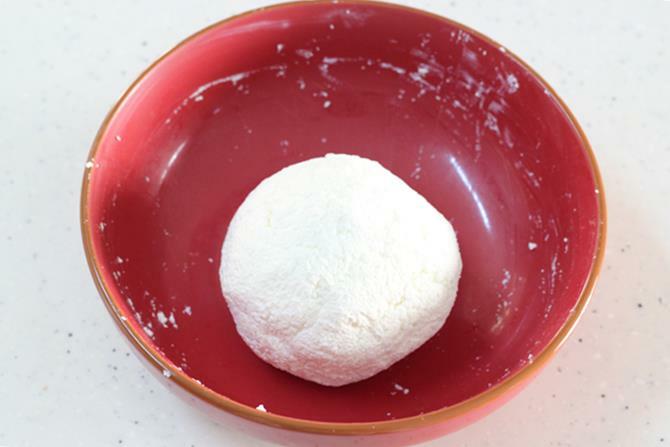 Original way making it from scratch – This involves making chenna or paneer. Next shaping to discs. Later boiling them in sugar syrup. Lastly condensing the milk to a creamy texture called rabri. Towards the end dunking them in the rabri. 2. 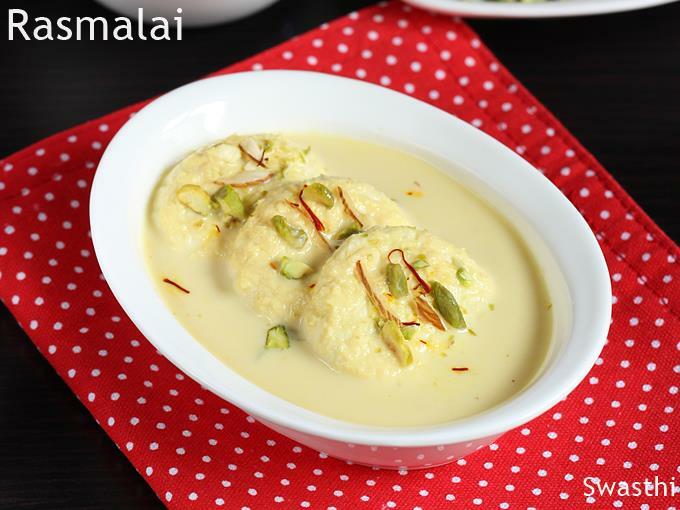 Quick easy rasmalai – use the store bought rasgulla like the Halidram’s tin and a milkmaid. 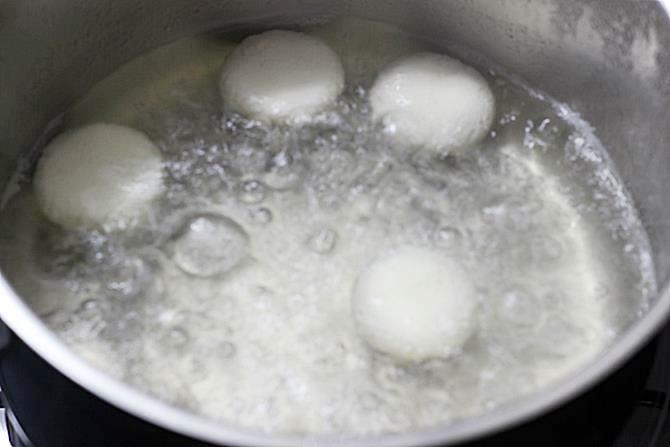 Then just squeeze out the syrup from rasgulla and dunk them in the simmered diluted milkmaid. 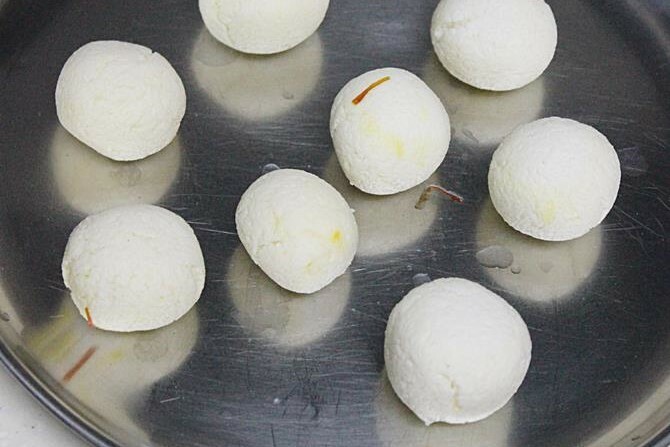 To make rasmalai in 10 minutes using readymade rasgulla scroll down to method 2. Rasmalai is a popular Bengali sweet delicacy made with Indian cottage cheese or chenna (paneer) discs. These discs are cooked in sugar syrup first to make them fluffy. Later served with chilled thickened milk. Rasmalai is garnished with chopped nuts. 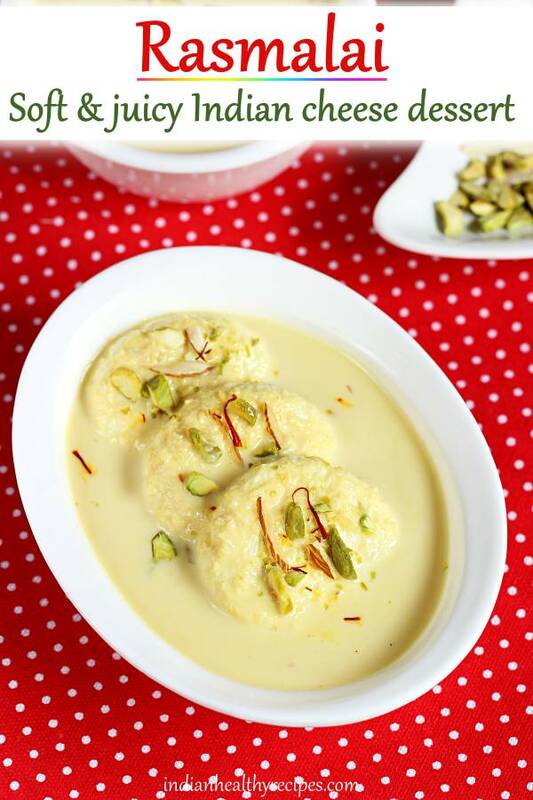 This recipe will give you the best soft and mouth melting rasmalai. Pour 3 cups milk to a heavy bottom pot and boil. 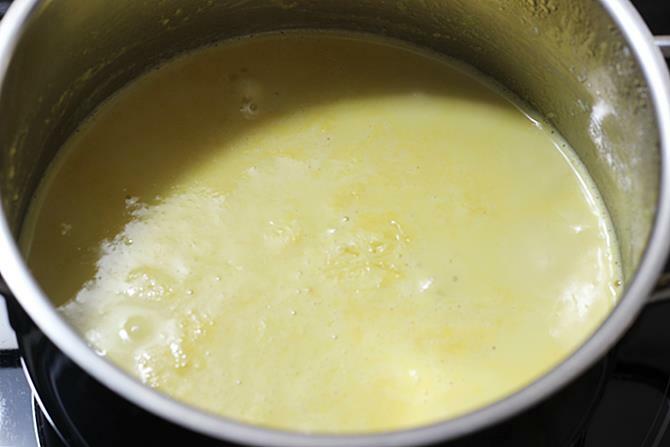 Add saffron and sugar when the milk comes to a boil. Reduce the flame to medium. Stir every 2 to 3 minutes to prevent the milk from scorching at the bottom. When a layer of cream forms, just move it aside. 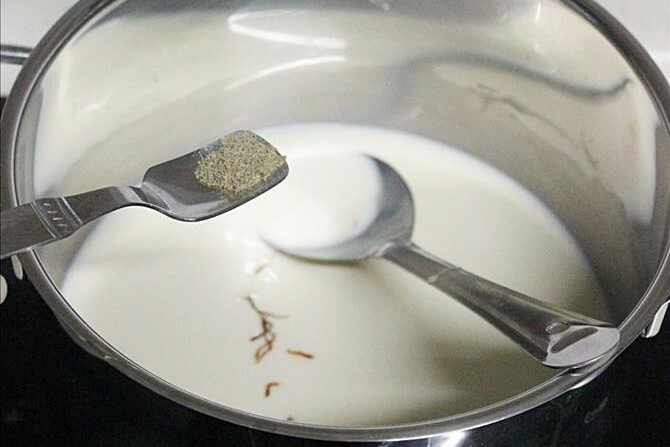 Boil until the milk thickens and reduces to half the quantity. Set this aside to cool. When the milk cools down chill it in the fridge. 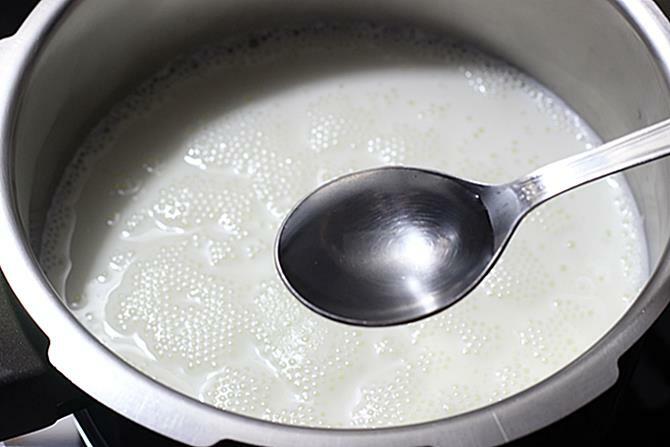 Boil 5 cups milk in a pot. Pour lemon juice and stir until curdled. If it doesn’t then add some more and stir. Pour ice water or add ice cubes to the pot and set aside for 2 mins. Drain to a muslin cloth lined over a colander. Squeeze off excess whey and make a knot. Next hang it for about 45 minutes to 1 hour for the excess whey to drain off. 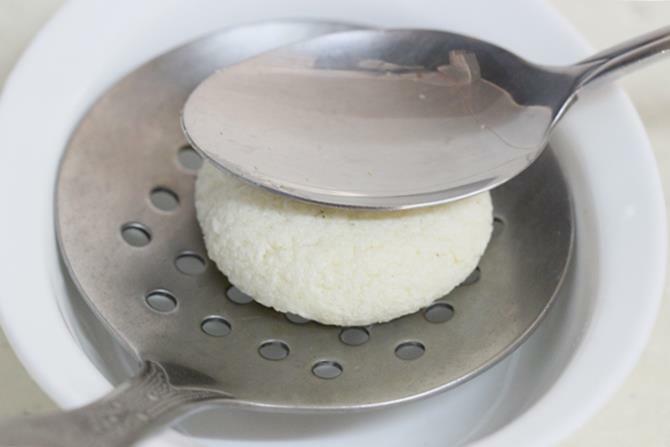 Transfer the chenna to a plate. At this stage chenna should not have any excess whey in it. Knead well for about 3 to 5 minutes until smooth. Chenna should not be grainy but must be smooth. Make 12 equal balls and flatten them to make discs. If the discs are slightly cracked on the sides, roll the sides gently. Set these aside. Bring 3 cups of water to a boil with 1 cup sugar. 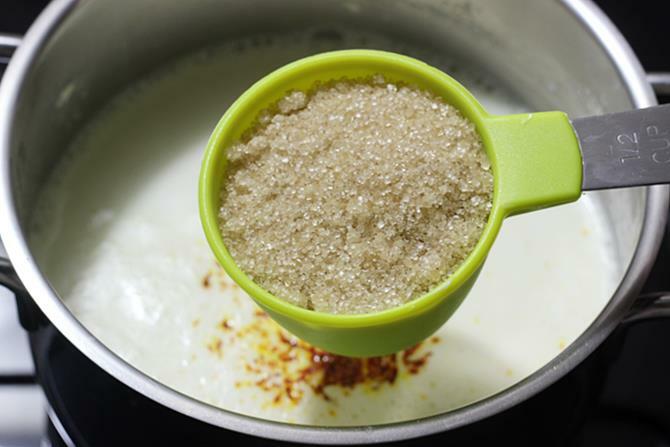 Stir until the sugar dissolves completely. Then add cardamom powder. Add the discs to boiling syrup gently. Cook covered for about 7 to 8 minutes on a moderately high flame. Take off the discs to a plate and cool them. 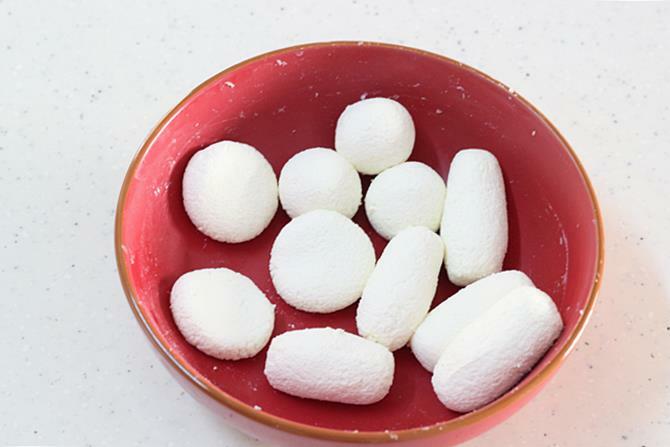 Squeeze them gently in between your palms to remove sugar syrup. Add these to the chilled thickened milk or rabri. If you wish you can also simmer for 1 to 2 minutes in the rabri. Allow to rest for few hours if desired. Garnish rasmalai with chopped nuts. Chill and serve it. 1. Making rabri. Pour 3 cups milk to a heavy bottom pot. Bring it to a boil on a medium flame. Add saffron/ kesar and keep stirring every few minutes to prevent burning. 2. Next pour sugar. I used organic sugar. You can use white sugar as well. 3. Adjust the flame as desired to suit your convenience. Do not use high flame milk may overflow the pot. 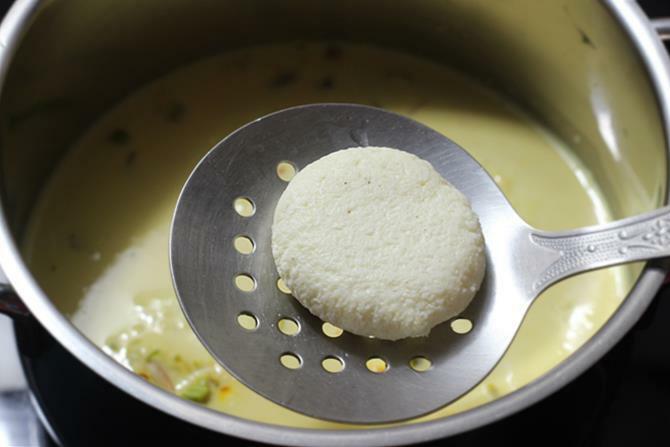 Keep stirring every 2 to 3 minutes, moving aside the malai/cream that comes on top. Turn off when it gets condensed to half the quantity. Chill this in the fridge. 4. 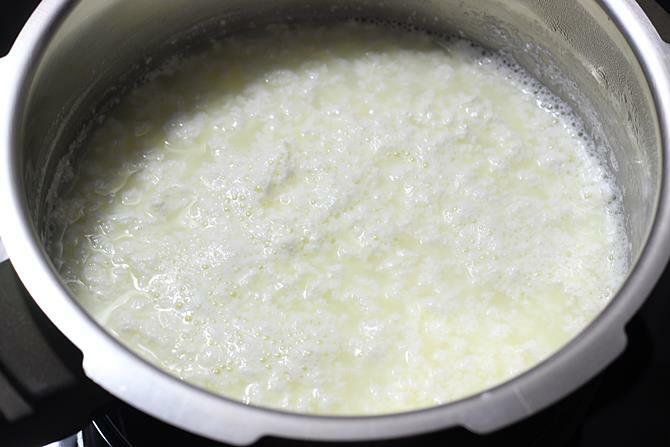 While the rabri is getting done, bring 5 cups milk to a boil in another pot for making chenna/paneer. 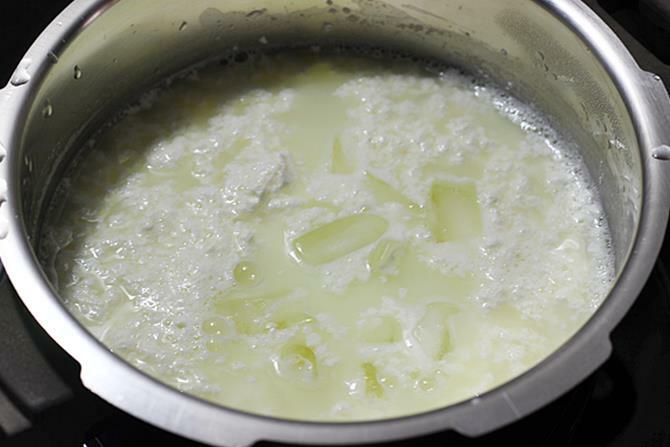 When the milk is boiling, then add curd or lemon juice or vinegar. 5. Keep stirring until the milk curdles completely. If needed add more lemon juice or vinegar. Switch off the stove. 6. When you see it has curdled completely, immediately add ice cubes or ice cold water. This is very important to keep the chenna soft. 7. Drain it up in a thin clean muslin cloth. 8. Wrap up the paneer in the cloth bringing together all the edges. 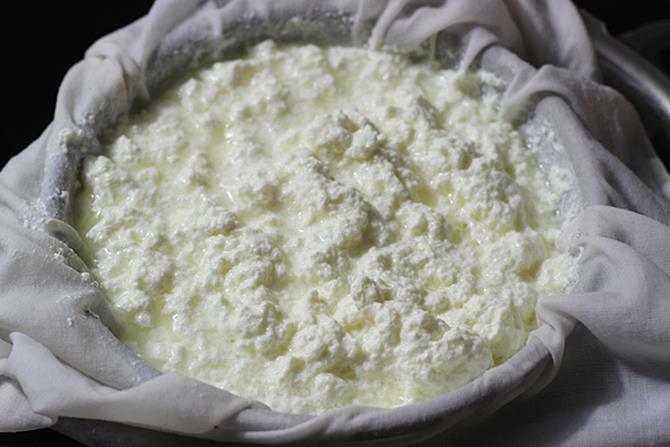 Put the cloth under running water, making sure the paneer is wrapped well in the cloth. Rinse it well under the running water to remove the smell of lemon or vinegar. 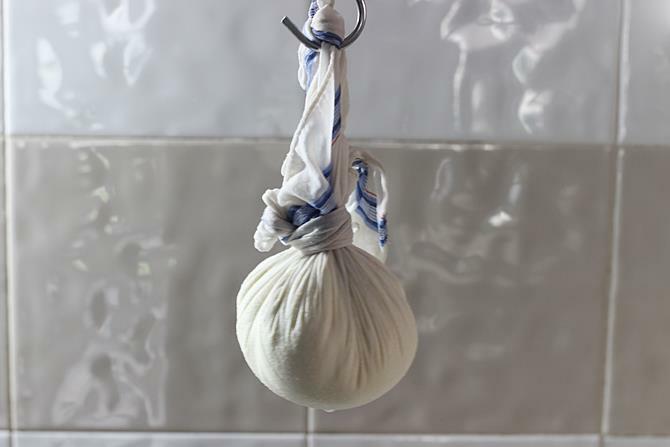 Tie up the paneer in the cloth like shown in the picture. Squeeze off the excess water. Hang it up on a hook for 45 minutes to 1 hour for the whey to completely drain. 9. At this step you must have chenna that is just moist with no dripping water and not sticky. Knead it well for about 3 to 5 minutes. You must not knead to the extent that chenna begins to release grease or fats. 10. Divide it to 12 equal portions. Make balls and flatten them gently. You can also make rasgulla or chum chum. If you find the edges cracked up, gently smoothen them. Cover and set them aside. 11. 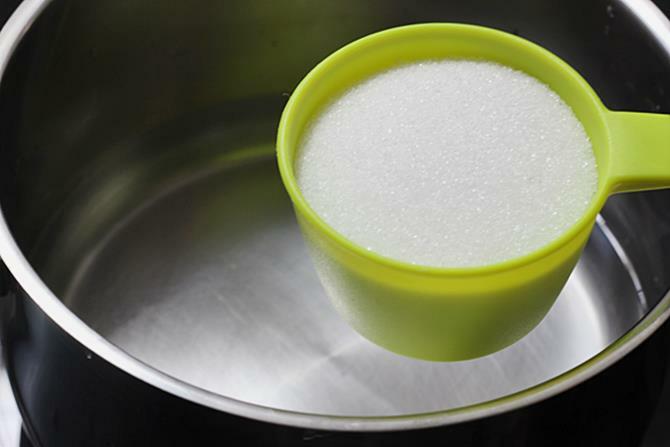 Bring 3 cups water to a boil with 1 cup sugar. 12. When the syrup begins to boil, add cardamom powder. 13. 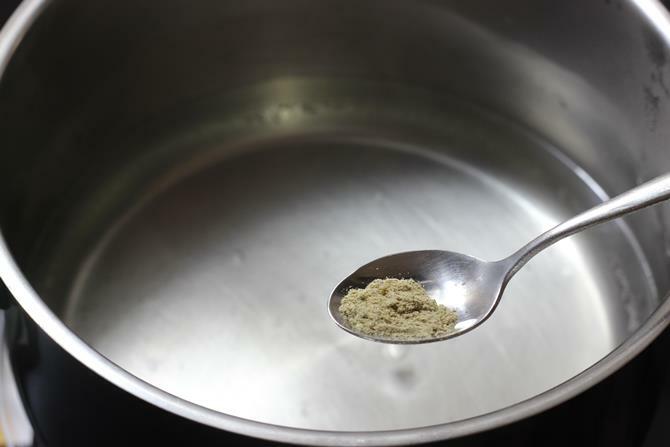 Next when the syrup begins to boil rapidly, add flattened discs of chenna. Cover immediately and cook on a moderately high flame for exactly 8 minutes. 14. The discs would have doubled in size. 15. Take out one by one and cool. Gently squeeze them in between your palms to remove the absorbed sugar syrup. You can also do it with a spatula and spoon. 16. Add them to the rabri. 17. Add chopped pistachios, almonds and cashews. You can also simmer for just one to 2 minutes on a low flame for the milk to be absorbed by the discs. Do not overcook at this stage, they may break. Serve rasmalai chilled. Using ready made rasgulla and milkmaid. 1. You can use any ready made rasgulla. Squeeze the syrup out of the balls. Do not press them too hard, they will break. Make sure that the syrup is extracted from the balls else they will not absorb the milk. Set these aside. 2. 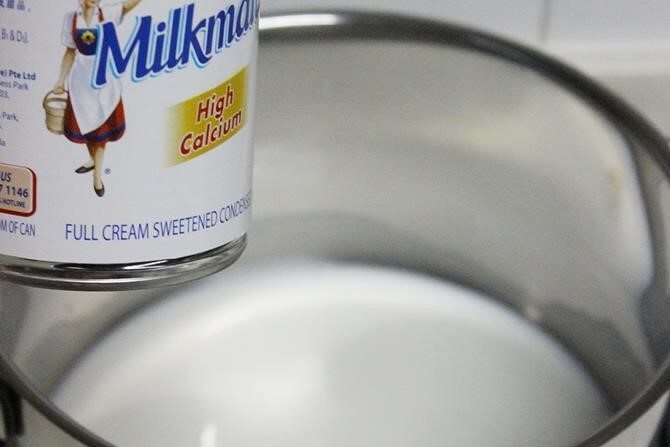 Pour milk and condensed milk in a pan and bring it to a boil. 3. Add saffron and cardamom powder. 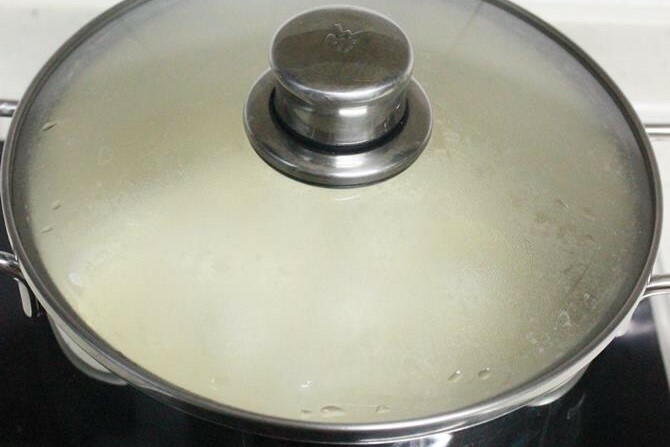 Simmer it for around 5 to 6 mins so that the milk blends well with milkmaid. 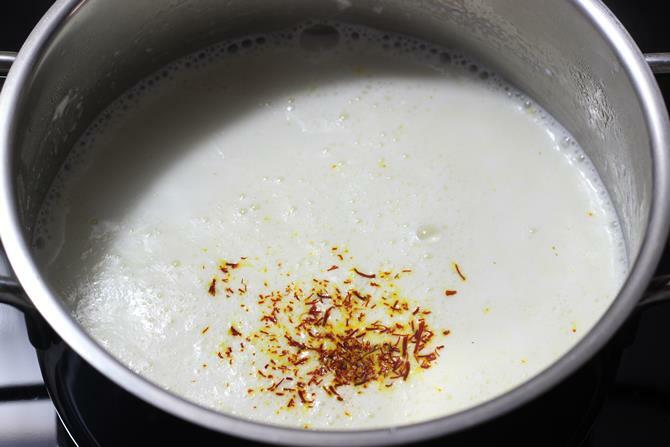 Alternately, You can melt the saffron in little hot milk and add too. 4. Reduce the flame to medium. Add the rasgulla to the condensed milk. 5. Cover with a lid and simmer for a min or two. Overcooking can break them. 6. Easy rasmalai using rasgulla is ready in less than 10 minutes. Garnish with nuts. You could add the chopped nuts at step 4 too. Note: It will be sufficient even if you use ¾ th can of condensed milk (392 gms) and 1.5 cups of milk. We have a sweet tooth, so I use up the entire can and we enjoy the creamy milk too. So adjust to suit your need.